Lawdy, Lawdy, it’s been awhile! I have been a busy little bee and just haven’t been able to get to this little blog. We’ve got an older home, which needs plenty of work done to it so I’ve been working on a few, not so small projects. Billy is off for the summer, andI like to spend time with my man. And because it’s summer, there are lots of fun things to be done, and I’m doing ‘em! But I’m here now and have one of my favorite desserts to share with y’all. 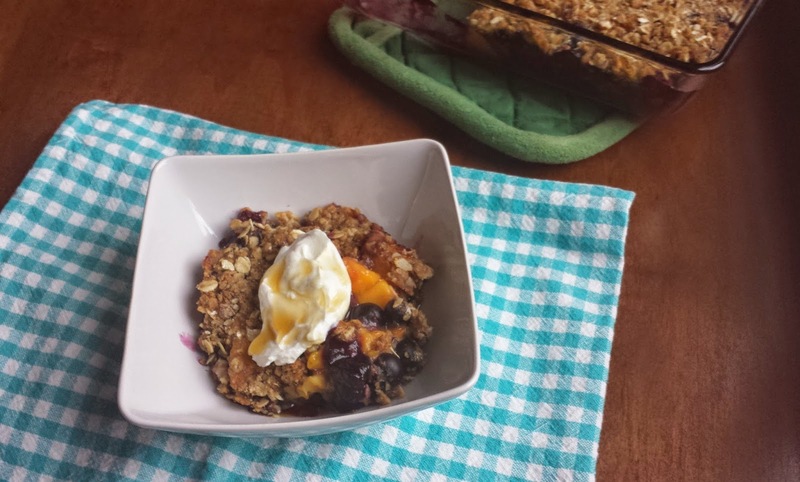 Blue Berry Peach Crisp. I love a crisp because I can use any fruit that I have around, and even though I may be fussy at times, a fruit crisp isn’t. This recipe uses less refined sugar than a typical crisp might. I’ve also sneaked in a little nutrition in the topping by way of nuts and flax seed meal; you don’t even know they’re in there. 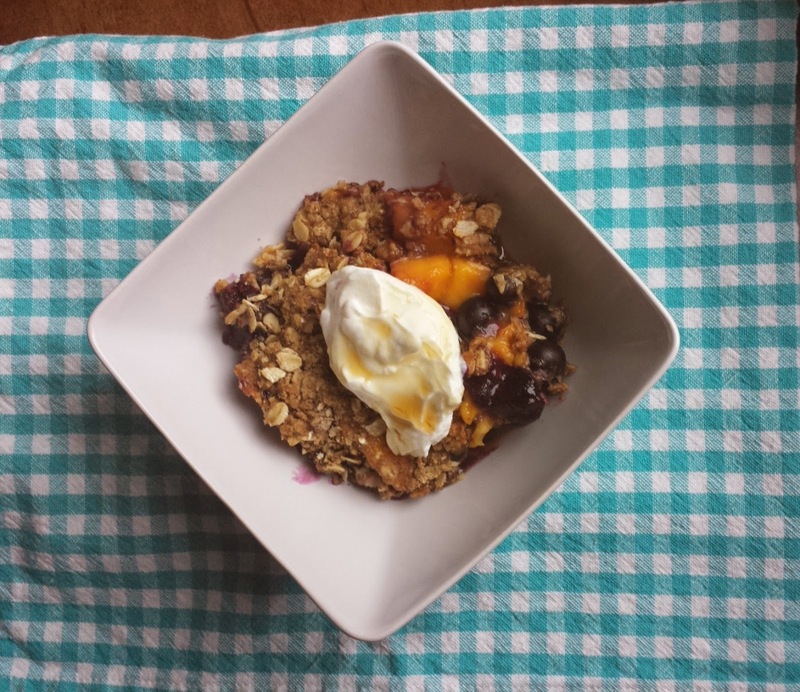 I like to top a big ol’ bowl of Blue Berry Peach Crisp with a dollop of plain Greek yogurt and just a touch of maple syrup over that. 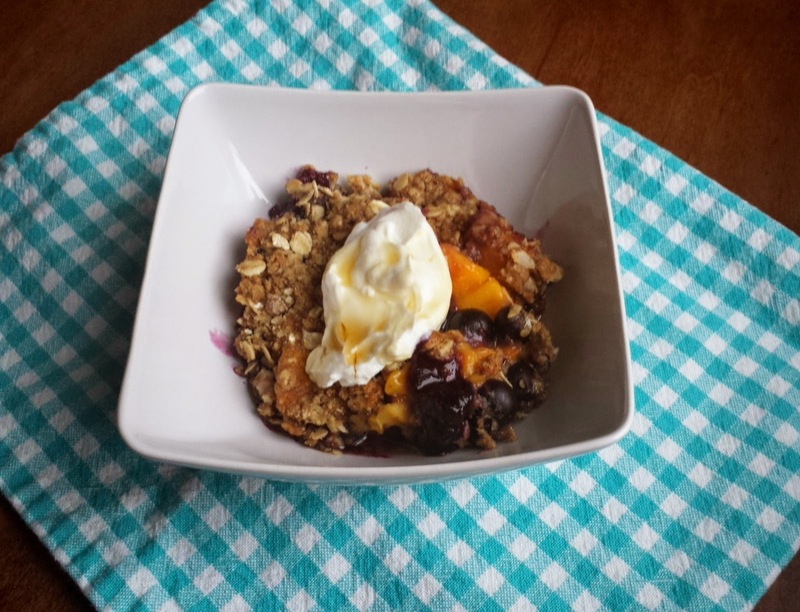 A scoop of vanilla ice cream is always good as well, and because Blue Berry Peach Crisp is loaded with fruit and oats and is pretty much a healthy snack, you might even get crazy and have two scoops of ice cream! 2. 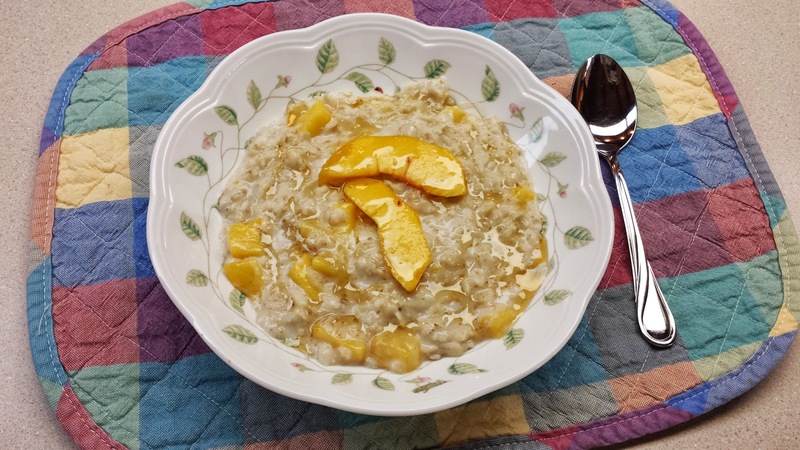 To make the filling; combine all of the ingredients for the filling in a medium bowl, and stir well, but stir gently as not to break up the fruit. Pour the filling into an 8 x 8 x 2 inch baking dish, or your favorite dish for making crisps. 3. To make the topping; in a medium bowl combine all of the topping ingredients except for the butter and the maple syrup, stir well. Add the cold butter and cut it into the dry ingredients using a pastry blender or two knives, until the mixture resembles coarse crumbs. Stir in the maple syrup. 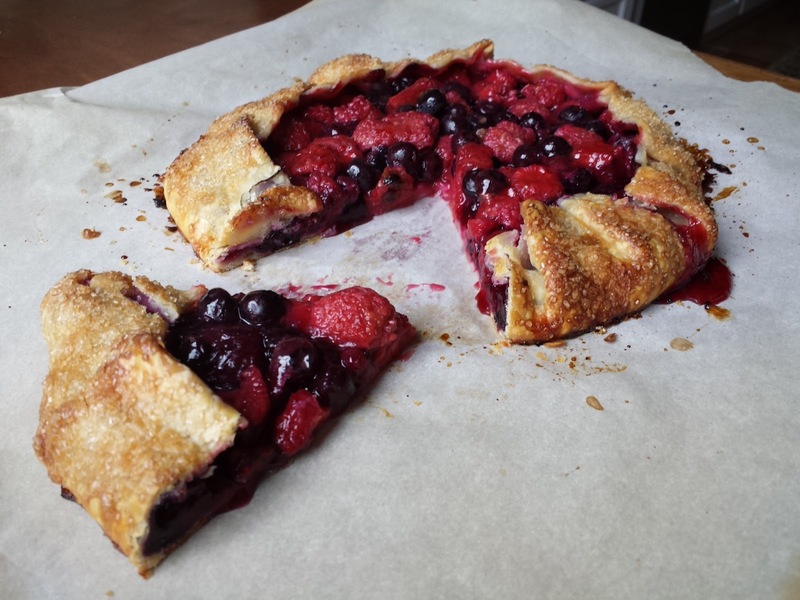 Distribute the topping over the fruit filling in an even layer (hands work best). 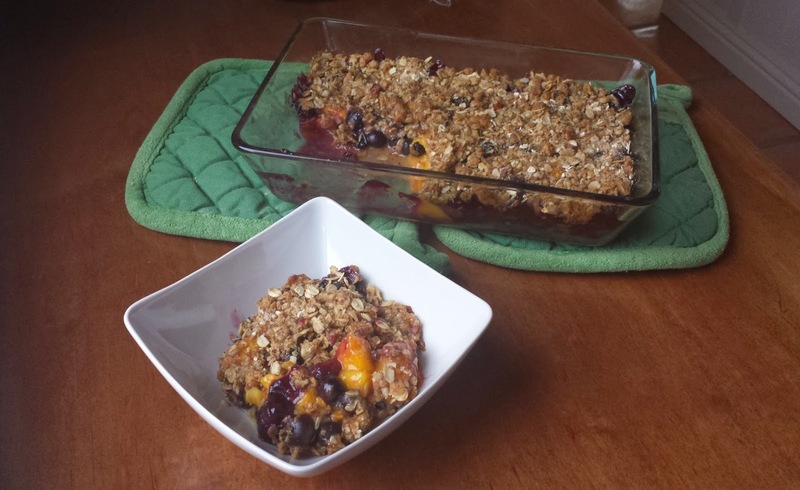 Bake 25 to 30 minutes, until the fruit filling is bubbling and the topping is deep golden brown. 4. Serve hot with whipped cream, ice cream, or plain Greek yogurt drizzled with a touch more maple syrup. *Note, you may omit the nuts or the flax seed meal, just replace it with the same amount of oats. Kari - you know I love this! You are so creative adding the flax to the mix. What a fantastic idea! I eat flax meal almost every day with plain Greek yogurt - gotta try this! Kari, now I know what to do with that flax seed in my pantry! this looks so good! Thanks for stopping by my blog!